For booking your adventure vacation to Southeast Alaska’s Boardwalk Lodge, please contact us at our toll-free number 800-764-3918. Additional information including brochures, videos, rates etc. is available upon request. 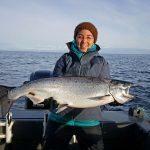 Alaska’s Boardwalk Lodge is Southeast Alaska’s premier Orvis Endorsed Lodge. We maintain a scenic oceanfront property with two guest lodges that comfortably accommodate up to 19 guests. Your stay with us during peak season is all-inclusive (excluding taxes and gratuities). From gourmet chefs to Alaska’s most experienced freshwater guides and saltwater skippers to first-rate fishing gear, we are here to accommodate all your needs and most of your desires.